Pursuing Peyton: How does Mahomes´ 2018 stack up against Manning´s record-breaking 2013? Patrick Mahomes didn't need long to take the NFL by storm, in fact he didn't even need half a season. 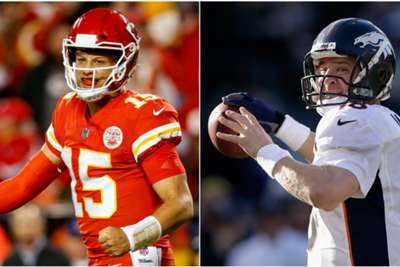 Through eight games, the Kansas City Chiefs quarterback has been the most electrifying player in the league, justifying their decision to make a huge trade up for him in the 2017 draft in incredible fashion. His staggering beginning to life as an NFL starter - he played just one game in 2017 as he sat behind Alex Smith - has seen him throw 26 touchdowns, putting him on pace for 52, which would see him just three shy of the record 55 put up by Peyton Manning and a juggernaut Denver Broncos offense in 2013. How does Mahomes' campaign so far compare with the one Manning produced five years ago? We took a look at the Opta numbers from the first eight games of those seasons to find out. The raw numbers from Manning's first eight games in 2013 and those of Mahomes this year give the edge to the future Hall of Famer. Manning threw for more touchdowns, more yards per game and more yards per attempt in that period. His superiority may be explained by him attempting 333 throws in that period to Mahomes' 285 this year. However, that kind of disparity also serves to make Manning's considerable advantage in completion percentage more impressive. A more thorough examination of the the data provides further evidence of the 2013 Manning being the more prolific, but indicates Mahomes having a greater overall impact on his offense and getting more of his team-mates going. Sharing the wealth among his receivers has been a feature of Mahomes' game, as it was Manning's in 2013. However, a favourite target is clear in both instances. Mahomes has thrown his touchdowns this year to nine different receivers, with Tyreek Hill his top target (seven touchdown catches). Through eight games, Manning had hit seven different receivers, with Wes Welker getting nine scores. Mahomes has obviously had little problem racking up the yardage, but he has not been able to match all of the gaudy numbers Manning put up in the same period in 2013. Through eight games of the respective seasons, each player had seven games with 300+ passing yards, Manning having two of 400+ while Mahomes has zero so far this year. Additionally, in each of his first eight games Manning had at least two touchdowns – with four games of at least four. Mahomes has seven games with at least two and five with at least four. Mahomes has had one game with zero passing TDs this year, but he did have a rushing TD in that game. Yet, in terms of overall statistical contribution to their respective teams' scoring, Mahomes has the advantage. Manning accounted for 30 of the Broncos' 40 offensive touchdowns through the first eight games of the 2013 season (29 passing, one rushing), or 75 per cent. Mahomes has had a hand in 28 of Kansas City's 33 offensive touchdowns this season – 84.8 per cent. Surpassing Manning's 2013 total appears a Herculean task. It is, in the eyes of most, the greatest season by a quarterback in history. However, if Mahomes continues accounting for such a high amount of the Chiefs' scoring, then there is every chance the NFL's newest household name could make league history.